How and when did you start practicing motocross? Julien Lieber: I got my first bike when I was 5 years old. Then I started to ride slowly around the house and next to the house, I really enjoyed it. When I was 6 or 7 years old I started to participate to some amateur races in 50cc, so it all started from there, because my dad was riding when he was younger, he rode for more or less 5 years as an amateur. At the end, he had to stop because of his job, but he transmitted his passion to me and my brother as well. What was your life before it? Did you practice other sports? What studies did you do? How was your life before? 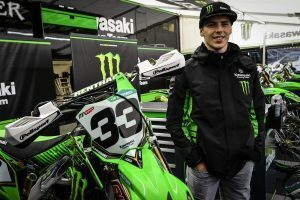 Julien Lieber: In my life there’s always been motocross, but before I had to go to school and with the school I could not train that much as I do now. When I was 16 years old, I stopped the school to focus only on Motocross and my training, to give 100% to achieve something in Motocross. Sometimes I miss my school times, because I left the school when I was only 16 years old and normally you leave the school in Belgium at 18, so I lost 2 years. But it was not possible for me to focus on both parts, the sport and the school because I lost a lot of school days for going to the races. That’s a part of our life, we have to sacrifice a lot, you have to train instead of going out with friends and you have to be more serious or let’s call it professional than the others at our age. You have been trained since 2017 by Yves Demaria of LMT. What has been so far the experience with the training academy? How have you matured so far? Julien Lieber: I was working already with Yves in 2015 actually, because he was working for Yamaha at that time with Valentin Guillod as well, so there we started to train together. It was different comparing to what I was used to, because I had to leave my home country to go to southern France at Yves’ place. He taught me a lot of things, especially that I had to work more on myself and to train with consistency every day. Also training with Valentin was good for me at that time. We were working almost every day together, now, since this year, I am more back in Belgium at my place, because last year I was in southern France for most of the time and I was only thinking about motocross, I was too focused on my training, this caused me some mental problems at the middle of the season last year. So we decided, that it would be better for me to go back to Belgium for some time, to stay with my family and friends and to have more time as well to have fun and relax. But of course Yves gives me work to do when I go home and I do it, we are also in contact every day. It has to be a good balance for the complete season, you cannot only train every day for the whole year, without doing other things, and expect to have a solid or good championship. Of the many races you have run, which one has been the most exciting of your career? Julien Lieber: In 2017 in Lommel, Belgium. It started not very good on Saturday, but on Sunday I had two good races, especially the second one, where I finished second and I went on the podium with the third place. It was cool to make a podium on my home G, that weekend we also made the ‘’perfect weekend’’ as KTM riders, because KTM made the complete podium in MX2 and MXGP class as well. I was the only privateer between all the factory riders, so that made me very proud. Which one is you favorite track? Julien Lieber: The MXGP calendar changes every year, but from the last few years I really enjoyed the track in Russia, Orlyonok, as the layout is very nice and there is a lot of speed and nice jumps. The mechanic is important for a perfect tuning of the bike. What is the relationship with your mechanic? Julien Lieber: The relationship with my mechanics is very important. We practice a lot during the week, so here in Kawasaki I have two mechanics: a race mechanic and a practice mechanic. We have a good relationship and a lot of fun together, they also both speak French, so it’s very easy for me to communicate with them. It’s cool that we can work together and be serious, but also have fun together. How is the relationship with Yves? Julien Lieber: We have a really good relationship. I know him for a long time already and I think our relationship developed every year. He knows me better, also today to understand me, how I work and I also know him better than few years ago, so we have a good relationship and he knows that if he tells me to do something, that I will do it. I think he trusts me and he knows that I work a lot and that I do everything I can. He gives me as much confidence as he can. How important is your family support? Julien Lieber: The support of my family is very important, they are always with me since my childhood. My brother was riding also when he was younger and we were always together. Till now they come to every race and it’s good for me to have them with me. It’s a good support. I don’t like going to the races without them. How is your relationship with your team mate? Julien Lieber: The relationship with Clement is good, I know him since years. Also out of motocross, we do some activities together, like riding the bicycle and other sport activities. We have a lot of fun together and we also come from the same part of Belgium, so we know each other good. When we are at the gate there is competition with every rider of course, but during the week we don’t feel in competition at all. What is the balance of the first races, what are the objectives for this season? Julien Lieber: I’d like to be consistent at first and to achieve a good final position at the end of the championship. I’d like to be in the top 7 or close to the top 5 in the championship and I would also like to go on the podium of course.